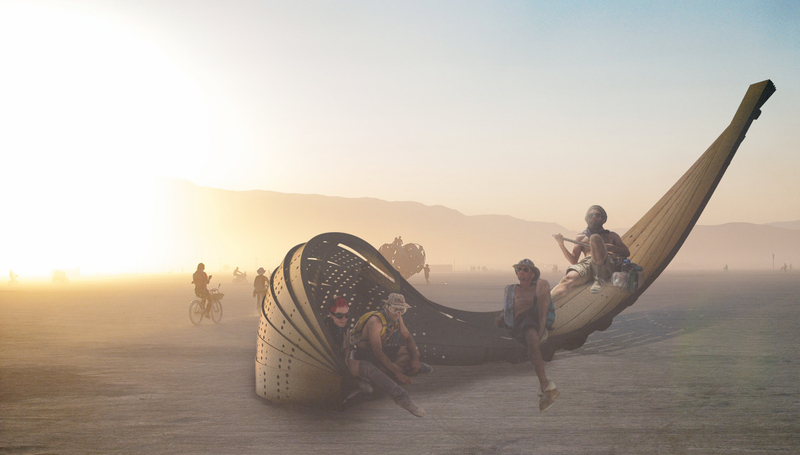 ‘Shipwreck’; a plywood pavilion beached upon the sands of the Black Rock Desert by the retreating Quinn River. A standing edifice of the primal force of the elements, abandoned in a remote location with a lost past, with stories to tell. A site of exploration and discovery, slowly a microcosm is born with the wreck as its host. Gone are the fanciful images of trunks of gold and silver, the rewards of this stranded vessel are immaterial. A habitat that can support life; create a new history and purpose for itself, offering those whom choose to accept it a place of calm and rest as it diffuses the currents of the prevailing winds that pound it and provides shelter from the intensity of the sun’s rays. Interactive on several levels, ‘Shipwreck’ stands as a piece of event architecture; a spatial construct where movement around it is transformational. Whilst it offers a temporary reprieve from the elements, it is ultimately a place to gather, encouraging intimate social interaction between new and old friends. Visually, the main structure is composed of two concave forms – the cave (of the earth) and the hammock (of the sky), each serving a different purpose. Whilst this duality offers a counterpoint between earth and sky, the pavilion remains one structure, one visual entity. It stands somewhere between the realms of both sculpture and architecture – a spatial construct where movement through, and around, it is transformational and social gathering is encouraged, resulting in intimate social interaction. The principal structure is composed of multiple steam bent plywood strips, each perforated with a predetermined pattern of circular holes composed in a wave formation. 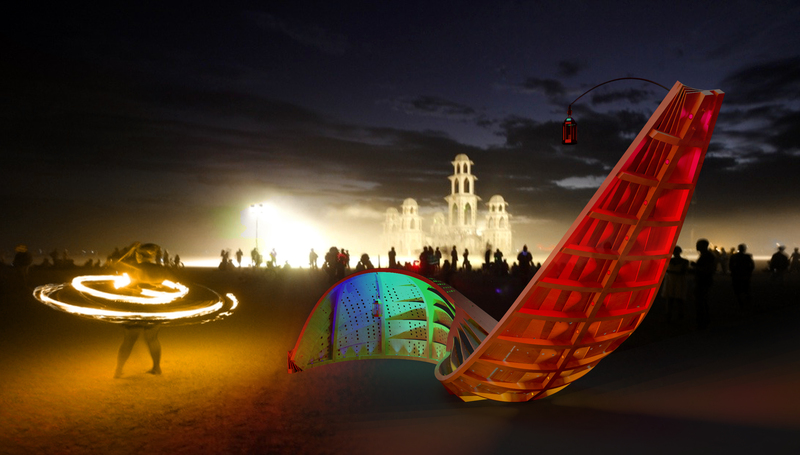 The perforations serve to allow patterns to be cast on the playa floor, both throughout the day as the sun tracks around the pavilion and at night when the structure is illuminated. 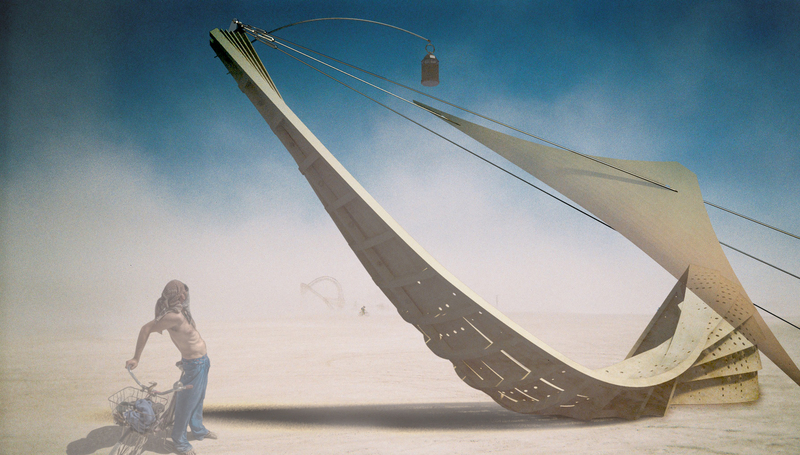 The guy wires offered a further design opportunity to incorporate a sail, an additional reference to the shipwreck concept. 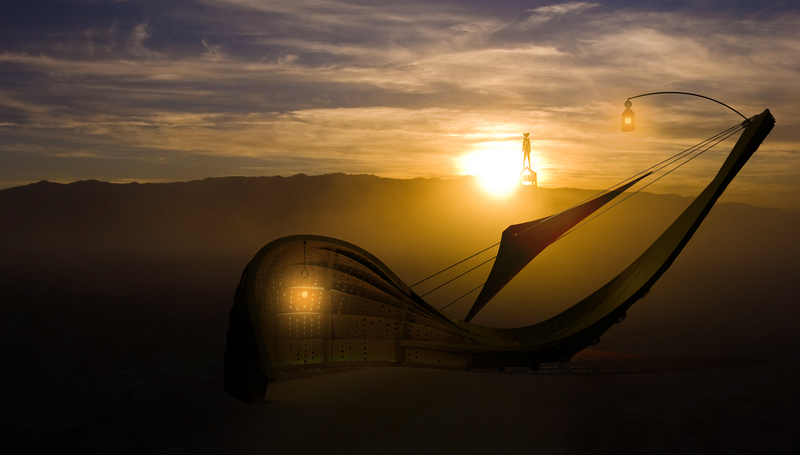 The fabric sail would provide shade and a degree of protection from the prevailing winds to those occupying the hammock structure. During the festival, I propose two different, independent lighting systems, both using battery powered LEDs. The first echoes the shipwreck narrative of the proposal, using two ships lanterns, illuminated using yellow hue LEDs. The lanterns would be easily detachable during strong winds. The second system would use an array of multicoloured LED uplighters, illuminating the cave with an underwater wash of blue/green light and the hammock a glow inspired by the colours of a sunset. Your passion is incredible. I’m moved in an indescribable way! Wow!